You are here: Home / Advertising / Mindless Eating Goes Mobile: HealthGamers Unite! Feb. 18, 2015 Interesting pairing of mindful eating with the ongoing distracted driving problems which I’ve written about often regarding what works to drive behavior change…in this MD’s new wellness post connecting the dots with both! So I’m thrilled to see that Cornell University Food and Brand Lab has already popped into the mobile scene as part of their health games research initiative with their new Mindless Eating Challenge mobile app! Shaping Youth has tons of research parallels with Dr. Brian Wansink’s Mindless Eating site and findings on media/marketing influence, persuasive tactics, portion distortion and product placement, so I’m excited to give their app a whirl, where players are tasked with caring for a virtual pet in Tamagotchi style fun. 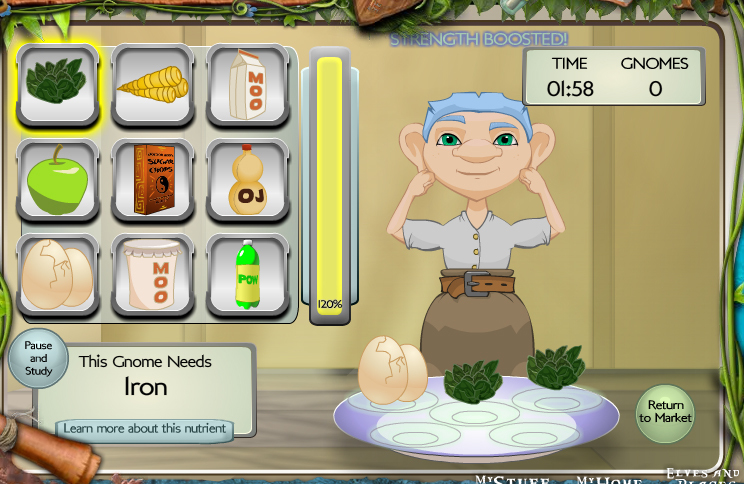 We actually just finished testing this concept inside the virtual world of Elf Island with our ‘feed the gnome’ nutrition GoodQuest…but truth be told, our wellness/counter-marketing sessions are a different beastie…They still work better hands-on with tactile/sensory feedback. Why? Because so far, the success of our ‘hands-on demos’ and experiential, tactile, participatory learning are hard to duplicate digitally. For us, the ‘virtual pet’ idea is a bit overdone, though tried and true research-wise, so given our lab/nutrient data constraints it ended up a bit schoolish and didn’t translate as well as we’d hoped. Still, it DID give us experiential learning of our own on how to improve/apply the virtual pet research in-world more whimsically and engage kids at multiple levels. In the end, the fruit/produce ‘feed a family’ success was still well worth it to be a part of the amazing Elf Island VW and to meet Fresh Producers’ objectives! Meanwhile, our own Dare to Compare counter-marketing games remain a ‘different beastie’ and are just not going to end up being a mobile app any time soon…even though it’s the first thing investor/advisor allies say when they see it! “oooh, you got an app for that?” or “you should go mobile!” Ahem. Perhaps more than any other persuasion data, the tactics of Brian Wansink, Ph.D known for his Mindless Eating book and teaching toolbox using the psychological cues of intention (CBC calls his book ‘the Freakonomics of Food) has some definite overlap with our own counter-marketing projects…so good luck, gang! I’ll eagerly await your outcomes! Beginnings of a mobile health game movement? In my last post on mobile phone-based health games, I gave you an overview of Mindless Eating Challenge, a game by Cornell University Food and Brand Lab, funded in part by the RWJF (Robert Wood Johnson Foundation) as part of their health games research initiative. As I had hoped, I was able to interview JP Pollak, doctoral candidate and lead researcher for the project. JP gave healthGAMERS an inside look at this amazing project designed to teach middle school children about healthy eating through care of a virtual mobile pet or plant. HG: Why did you choose the book Mindless Eating to create a mobile game? Who came up with the idea? JP: The Cornell University Food and Brand Lab, directed by Dr. Brian Wansink has done some amazing academic work on this subject, and the popularized book Mindless Eating has received much well-deserved recognition. Brian approached us (the Human-Computer Interaction Lab, directed by my advisor, Dr. Geri Gay) looking for a way to reach more people with the Mindless Eating message and the Challenge. Basically, they have lots of great findings, and many people have had good results when participating, but they felt they could reach more people through technology and a more interactive medium. After exploring many possibilities, we decided to target kids and make a game out of it. Of course, the emphasis of our lab’s work is mobile technology, so the fact that it was going to be a mobile phone game was a given. Then it was just a matter of taking a good look at existing research and games and seeing what worked. Virtual pets have been extremely popular (Tamagotchi, Nintendogs, etc. ), and there is actually a fair amount of literature suggesting pet/ plant care can be used to encourage or reinforce behaviors. HG: What aspects of the book were incorporated into the game? JP: We use the eating tips from the book and from the Food and Brand Lab’s research as the healthy eating prompts for the game. There are specific tips for snacks and for each meal and they vary based on the persons goals (losing weight, eating healthier, etc.). HG: Is Mindless Eating Challenge specifically an iPhone app or is it a general mobile application? JP: We have a J2ME version, a mobile-optimized web app, and there is an iPhone app currently in development. Each has pros and cons. HG: Was program design done in-house? JP: All of the design was done in house. The pets and graphics as well as some of the early coding was done by Sara Lin, a fantastic student working in our lab who has since graduated. HG: What are the major goals of the project? JP: The goals are two-fold. First, we want to do good and improve health outcomes for kids. The game is designed as a persuasive technology that we hope will improve eating behaviors in kids while they eat, and ultimately improve their awareness of what their eating and their self efficacy around eating. Second, we’re an academic lab, so we’re interested in what we can learn from the game. For example, what are the underlying mechanisms of gameplay that can be used to change behavior? How does social influence play a role in behavior change? These are questions that have been answered in other domains but haven’t been adequately addressed in terms of persuasive technology and health games. Better understanding of these issues should inform the development of future health games that can be even more effective. Addressing some of these questions is also the goal of the Robert Wood Johnson Foundation Pioneer Program grant we received to support our work on the game. HG: What health results do you hope to see in players who use Mindless Eating Challenge? JP: We hope players diets improve, that they become more aware of what they are eating and what they should (or shouldn’t) be eating, and that we can improve their confidence that they can make a positive change in their eating behavior. We completed a study with 70 middle school students in upstate New York this spring and are currently working on getting the findings published. We think they support some of our goals quite nicely. HG: Will this game ever be made available for public consumption? If yes, when should we expect the launch? JP: This is a goal of ours. We need to first answer a few more research questions and address some scalability issues, so unfortunately it’s hard to say when this will be available to the public. I hope JP is correct about the possibility of Mindless Eating Challenge being made available to the public. I think the market, especially the iPhone App market, is ready for a mobile health game. We look forward to the results of the study!